Four of the twelve clubs from the 1925 -1981 era of the Victorian Football League are different from the other eight clubs. The eight clubs are Carlton, Collingwood, Essendon, Geelong, Hawthorn, Melbourne, Richmond and St Kilda. The other four are Fitzroy, Footscray, North Melbourne and South Melbourne. The reason is that the group of eight mentioned have never changed their name away from their original suburb unlike the group of four. South Melbourne and Fitzroy did because they are no longer playing in Melbourne. South Melbourne was relocated from their home at the Lake Oval in South Melbourne after the 1981 season and became Sydney in 1982. Fitzroy merged (or were taken over by Brisbane) during 1996 so there was no more Fitzroy. The nickname of the Swans remained and Fitzroy’s (relatively newish) nickname of the Lions was taken to Brisbane to replace the team from Queensland’s Bears nickname. North Melbourne became the ‘Kangaroos’ for 1999, running with their nickname- Kangaroos a nickname that North had been using for less than half of North Melbourne’s existence. They were rewarded with the AFL Premiership in that 1999 season before returning to North Melbourne for 2008. Footscray of course haven’t changed back- we have been Western Bulldogs from the 1997 season and still are. The Swans, Lions, Kangaroos and Bulldogs were never the original nickname of these four clubs- Fitzroy have had a few nicknames through the years- the Gorillas was one of those and it is well within the memory of many Fitzroy and non-Fitzroy fans. St Kilda is unique from the (then 11) Melbourne clubs and Geelong in that they can say that they have a supporter base from two separate geographical areas of Melbourne. Those being their original home in St Kilda where they resided from their beginning until 1964 and then Moorabbin and the suburbs near to it from 1965- 1992. (1)	The St Kilda Football Club supporter who still lived in or near St Kilda the suburb. (2) The St Kilda Football Club devotee that was (or their family was) originally from St Kilda the suburb, but had moved away after the war to near Moorabbin. So the football club’s home was physically closer to where they lived. Would prefer to stay at the Junction but accepted the move to Moorabbin. 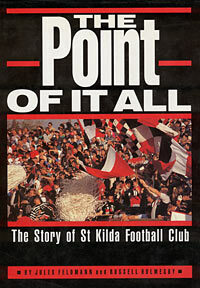 St Kilda have moved home quite a few times and there was angst with each move although some more than others. The leaving of the Junction Oval to play at Moorabbin for the 1965 season created major turmoil and the more recent 1992 decision to play home games at Waverley from 1993 was also controversial and divisive. The decision to leave Waverley for the brand new Docklands Stadium in 2000 was seen by some Southern Saints fans, as another annoying move after just becoming settled at Waverley. For all the chopping and changing and in particular the move away from the Junction Oval at the end of the 1964 season to Moorabbin in 1965, they always kept St Kilda despite the fact that Moorabbin is miles and miles from St Kilda and Waverley is even further away. Initially it seemed they would drop St Kilda and adopt Moorabbin or combine both St Kilda and Moorabbin in their name. They are still St Kilda and probably always will be. All St Kilda fans should have the copy of the official St Kilda history book, written by the late Jules Feldmann and Russell Holmesby. Their brilliantly named tribute to St Kilda “The Point of It All” provides some of the background to the departure from the Junction Oval. It was by no means a unanimous decision and many Saints fans were aghast. These paragraphs are directly from pages 167 and 168 of The Point of It All (TPOIA). But there were wider issues evident in these opening lines from the 1963 annual report: “In summing up, your committee considers that the present method of distribution of football revenue is archaic and farcical.” Those words gave a hint of what was to come for a club tired of having the bulk of its profit from match receipts “siphoned off” to the ground manager, St Kilda Cricket Club. The only way for St Kilda to beat this arrangement was to secure its own ground. In 1960, the idea of moving to a ground such as Elsternwick Park had been aborted when the St Kilda Cricket Club had promised to spend 7000 pounds on room improvements at the Junction Oval and it was announced that the football club would stay there for 10 years. Despite attracting record crowds, the club was losing vast amounts of money it needed to compete on the escalating inter-state recruiting market. Late in March 1964, St Kilda dropped a bombshell by announcing it would move to the Moorabbin ground in 1965 and become the ground manager in its own right. One of the original conditions of occupancy discussed on March 17, 1964, at St Kilda’s committee meeting was: “The Moorabbin Football Club shall amalgamate with the St Kilda Football Club and the club shall be known as the St Kilda-Moorabbin Football Club for a period of 10 years, and after that period shall be known as the Moorabbin Football Club approval (providing is obtained from club members). On April 28, the president reported:”The condition originally imposed by the Moorabbin Council, namely that the name of the club be changed, has now been withdrawn.” A long forgotten rule in the club’s constitution stated that the name could not be changed unless three-quarters of the members voted for it. The law had been framed in the 1880’s when St Kilda amalgamated with Prahran. Veteran ex-player and Coach Wells Eicke resigned from the committee in protest. Some members also doubted the 100,000 pounds loan the Moorabbin council had promised would be enough to make the necessary improvements in facilities at Moorabbin. Then VFA PRESIDENT Alec Gillon initiated a motion that suspended Moorabbin from the association for a year. The sparks that flew in the days after the announcement ignited into an inferno when a member, John Sist took out a Supreme Court writ against the committee to prevent the club moving to Moorabbin or changing its name. President Graham Huggins hit back through an issue of leaflets at the final practice, re-iterating that the club’s name would not be changed unless members voted for it. It is still to be changed to Moorabbin. It definitely won’t be now as they left Moorabbin at the conclusion of the 1992 season. I well remember that saga and how a vote was held on whether St Kilda should remain at Moorabbin or move to Waverley. The Point Of It All was published in early 1992 and sadly one of the co-authors Jules Feldmann died not long after it hit the shelves. The Moorabbin/Waverley issue arose after this book was published. I often wonder what would have happened if this book had of came out in 1993 as no doubt it could have given a detailed account of the Moorabbin/ Waverley issue. The actual vote did take place although some people had their doubts about aspects of its validity and whether it was truly one- man/woman one vote. The club administration was pro-Waverley as was the then coach Ken Sheldon. The official resistance to leaving Moorabbin was led by a chap named Les Heimann. Things seemed to conspire against those who wanted St Kilda to remain at Moorabbin. The vote was held in the week after a home game at Moorabbin. St Kilda won all of their Moorabbin matches in 1992 bar one and that defeat was against us. It so happened that the vote was arranged to occur just after the Footscray game. It’s worth pondering what might have been if the vote was held after any other of St Kilda’s home games that season. In particular the Brisbane fixture from May 23rd that saw the then nicknamed Bears endures a 108 point thrashing in front of a happy and satisfied Moorabbin crowd. The Footscray loss was St Kilda’s second consecutive defeat, having fallen to Essendon on the MCG a week earlier. All hypothetical but if the Essendon loss had have been at Waverley for instance rather than the MCG, would this have had any bearing on the vote? The same again can be argued obviously with the Footscray defeat- if that happened elsewhere (in particular Waverley) or indeed if St Kilda had of won that game. Footscray had many injuries and were without crucial players and the result was great for us, but disastrous for the Saints who were clearly expected to win at home against and an under strength Footscray. I wonder how much of this may have influenced the vote. It was a very emotional issue and although unquestionably an important issue to address, it was not what St Kilda needed at that time because they were having a good season like the year before. In 1991 they made the finals for the first time since 1973 and 1992 was expected to be a further march forward. Sadly for the Moorabbin stalwarts, those who wanted Waverley as St Kilda’s home claimed victory in that vote. Moorabbin lasted until the end of 1992, before they were in some ways coerced into moving to Waverley Park. The vote about either staying at Moorabbin or moving to Waverley came over as somewhat ‘Not Quite Right’ as the Moorabbin loyalists saw their opponents win the vote. I well remember Les Heimann’s comments on television afterwards where he stated that the matter was now closed, “We are St Kilda first and Moorabbin second” There was one Moorabbin game left on the roster and perhaps fittingly and ironically it was against Fitzroy who moved in to the Junction Oval in 1970 five years after St Kilda had voted to leave it for Moorabbin. St Kilda’s last home match with Fitzroy was to be a farewell to their home from 1965. They won this game to send off Moorabbin in fine style and also gain the four premiership points they desperately needed to make the finals. They did take part in the September action beating Collingwood at Waverley, before losing one week later at their new home to us. Waverley was decided by the AFL commission in the late 1990’s that it’s time was up. This was despite the valiant efforts of many people who desired its retention as a venue for AFL football. In 1999 the Southern Saints like the Eastern Hawks had played their final home (and non-home) games there. For 2000 the Southern Saints joined the Western Bombers and us in claiming the Docklands Stadium as their new home. It was a mighty task convincing the St Kilda membership to leave Moorabbin for the gold dust of Waverley. Seven years later Waverley Park was gone and now nearing the end of 2009, it is in an advanced state of housing development. Despite the affection many of their fans had for Moorabbin, one of their all time greats- Harold Bray claimed years later that they should never have left the Junction Oval. There would be others who would have agreed. However unlike The Kangaroos and Western Bulldogs they have not changed their name. If they had of switched to Moorabbin and dumped St Kilda, no doubt the goodwill of many St Kilda locals to accepting the club moving to Moorabbin would have been lost and their supporter base (both dormant and active) would be nowhere near the size it is. By keeping St Kilda as their name they maintained links with their history as well as gaining the support of potential members in their new area. Footscray 1996-1997 St Kilda 1964-1965. St Kilda Football Club’s decision to move from the Junction Oval in St Kilda to Moorabbin was a tumultuous event like Footscray leaving the Western Oval after the 1996 season. Both moves were controversial and annoyed many fans of both clubs. However St Kilda’s quantum leap was not as troubled as the Footscray one. I have often wondered how Footscray would have gone if we had of done the same thing in the 1960’s that St Kilda did in 1965, in moving away- to another suburb. That suburb would have to have been in a (then) growth area, be it an older established suburb with developing housing estates close by. I think and consider if we had of done what St Kilda did and moved in a ‘hard and straight west’ direction to say Sunshine, Deer Park or St Albans or to the north of the Maribyrnong River where so many traditional rusted on Footscray fans moved to in the 1960’s like Avondale Heights, East Keilor, Airport West or further north west to Keilor. Another possibility would have been to move in a south west direction to an older area as in Newport, Williamstown and Altona, which are close to ‘the west’s’ (then) newer areas of Laverton, Hoppers Crossing and Werribee? The newer suburbs like Hoppers Crossing and Werribee in the south west, Avondale Heights, East Keilor and Airport West in the north- west also saw many of the ‘It is in the blood Footscrayites’ take up residence. By moving to any of those areas the club would have received the double benefits of taking the club to a newer area and winning new fans and also helping the second and third generational ‘It is in the blood’ fans introducing more easily fourth and fifth generation Footscray fans to the club rather than having children who supported another team. The point here is that with the team playing home games nearby, the probable third, fourth and fifth generation fan would stay. Or not be tempted away from the one great cause, lessening the possibility of other teams providing competition for the affections of likely Footscray supporters. Moving away from the Western Oval could have happened, as the club did consider it during the 1960’s- there was some discussion to moving into what is now Skinner Reserve at Sunshine back in 1965 for the 1966 season. This was caused by a falling out between the club and the council. The council was the ground manager and the old argument of money problems came to the fore in that dispute. Nevertheless both parties managed to sort out their quarrel and the club stayed put at Footscray then and on until 1996, when the then new administration moved us geographically away from the west- to Carlton’s ground in the northern suburbs where we played there for the three seasons of 1997, 1998 and 1999. That move to Carlton was never going to gain us any extra fans, the Docklands move in 2000 is better for Footscray supporters than being a rent paying lodger for the Carlton Football Club. What St Kilda did though and what we didn’t is a very interesting and thought provoking topic. Going to Moorabbin was probably a good option in the long run as it did open a gate to a new supporter base for them that they would not have been able to exclusively cultivate had they stayed at the Junction Oval. They did alienate many of their fans by this move- though the disenchantment was not as harmful to the club as it could have been, because they kept the St Kilda name despite leaving St Kilda. If they had of changed the name to Moorabbin, Southern Saints or something else with no mention of St Kilda, then they would have been not only catering for only, but also ultimately relying on the new fans out Moorabbin way to sustain the club. This is because the St Kilda residents and other suburbs near to St Kilda like Elsternwick and Balaclava that walked away would have increased by thousands and St Kilda football club would probably have been finished. The football club needed their traditional fans out St Kilda way, conceding them expendable and that they may lose them couldn’t be an option. Opposition to the move was naturally from supporters that lived closer to the Junction Oval than Moorabbin. Their chief annoyance was the idea that soon the St Kilda name would be dispensed with and that the club would become the Moorabbin Football Club or something else that made no mention of St Kilda. There was also the perceived lack of consultation with supporters and the proverbial ‘two fingered salute’ to both the St Kilda City Council and the long time supporters of St Kilda –in particular the local ones. How similar is this to October 1996? Almost eerily, save just a few crucial components. St Kilda Football Club was moving to a new area- where no other VFL team was domiciled in. They also had a significant support already living in or around Moorabbin as well as the opportunity to attract a new generation of fans to the St Kilda football club- a ripe untapped fan base in a growing area that wanted a VFL club to identify with. Having league football played their every fortnight made St Kilda the obvious team to latch on to. What else made the move more palatable was that the club was initially successful or more successful than what they had been at the Junction Oval. In 1965 the first year at Moorabbin the saints finished the season on top of the VFL ladder- this was the first time St Kilda had ever achieved this. Two of the 1925ers had already done it- Hawthorn in both 1961 and 1963- the first one also came with the Premiership. North Melbourne did in 1949, though they went out of the finals in straight sets. The other 1925er (yes us) is still to finish a season on top of the ladder. St Kilda then beat Collingwood in the Second Semi Final to progress straight into the Grand Final, but they somehow managed to lose comfortably to the fourth placed Essendon who won three finals that campaign to win the 1965 flag. Everyone who follows football knows about St Kilda and 1966, they had a fine season in 1968, made the Preliminary Finals in 1970 and 1972- the in between year they were 20 points up at three quarter time in the Grand Final but ran out of puff to a faster finishing fresher Hawthorn, who had the weeks break. They made the finals in 1973 beating Essendon in the Elimination Final at Waverley just like they had in 1972. 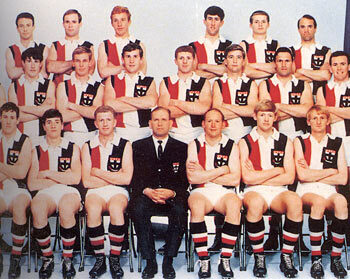 Therefore the first 10 years at Moorabbin from 1965–1975 was St Kilda’s best spell in their history. However it would be wrong to say that the move from the Junction to Moorabbin instantly improved the club and was the sole reason that they performed better on the field. St Kilda had made the finals in 1961 and 1963- the First Semi against Footscray in 1961 was their first final since the 1939 Preliminary, so they were clearly coming, on the way to a better era whilst still at the Junction. Moorabbin’s first game drew a crowd of over 51,000 people, later in that year another crowd of 50,000 would be there for the St Kilda v Essendon fixture. The Junction Oval wasn’t a lonely place though either- in the early 1960’s St Kilda was regularly pulling in crowds of over 30,000 – the last home game of 1963 saw over 44,000 cram into the Junction for the clash with Geelong. Their Junction Oval crowds certainly held their own against Moorabbin- not once in season 1961 did less than 20,000 attend a St Kilda game at the Junction. Keeping the St Kilda name and not tampering with the St Kilda playing uniform placated many who were unconvinced about the wisdom of the move to Moorabbin. With St Kilda gaining a foothold in that area down in Melbourne’s outer southern suburbs, older fans that still yearned for the Junction Oval could be satisfied that although the club had left its traditional home, the change of name away from St Kilda did not eventuate and that the widened fan base for the football club was a healthy thing. So the Junction stalwarts would have eventually found it tolerable even if they didn’t completely accept or support it. Could Footscray have made a similar move as St Kilda did in the 1960’s? Footscray moving away from Footscray in the 1960’s- how would it have panned out for the club? We will never know for sure and can only make a theoretical comparison with St Kilda and how they did their ‘giant leap forward.’ Would local Footscray residents have accepted it? Well possibly if we moved outwards to an area of our own just like St Kilda did. To an area where people could see that the Footscray Football Club were genuinely making an effort to widen our supporter base in the western suburbs of Melbourne. In doing this we would have gained a foothold in an expanding area, although we would have to have kept the Footscray name- as St Kilda did. If we moved to Deer Park (to use one example) then that area and the suburbs surrounding it should have clasped the Footscray Football Club and widened our support. However the 1996 Bulldog Taskforce seemed to believe that by giving Footscray the flick and adopting the generic (and underused for its purpose) Western as a name, then the residents of Deer Park and nearby to it like St Albans, Sydenham, Tarneit, Sunshine and even up to Melton would feel empowered to follow us in great numbers. Fourteen years of Western Bulldogs playing home games within walking distance to the centre of the City of Melbourne when not playing in Darwin, Canberra and other places has not and will not EVER gain a significant supporter base from the Western Suburbs. It can’t for the simple reason that the club is not being brought to the people- the people have to go to it. The western suburbs of Melbourne people who go to the Docklands Stadium can go and watch the Western Bulldogs play their home games there, just as they can go there and watch other Melbourne clubs play their home games at the Docklands as well. The relocation to Moorabbin was vastly different than the Docklands situation- it was for St Kilda and St Kilda only, the club was taken to that area. We as the Western Bulldogs taken away from Footscray have been shunted to nowhere that is exclusive to us. It might temporarily stabilize the support following that the wretched move to Carlton, but it won’t increase it. New fans haven’t come to the Western Bulldogs in the numbers that such a monumental upheaval warrants to justify that change. Footscray and St Kilda have many similarities, some obvious as in having three colours- both teams sharing the red and white- St Kilda’s third colour is black whereas Footscray’s is blue. Both clubs have endured very hard times on the field and often financially off it. The lack of success of both clubs makes the scenario of a Grand Final between the two clubs something that most neutrals (non Footscray and non- St Kilda fans) would be quite content with, especially since Geelong managed to consign St Kilda to Runners- up in 2009. The 2009 Preliminary Final was the Grand Final that most fans of those not involved in the finals wanted. Yet it wasn’t to be, due to St Kilda winning their first final on the Sunday and Western losing the day before to Geelong, meaning that these two could only meet in the Preliminary Final which they did. That 2009 Preliminary Final could be used as a microcosm to sum up the anguished history of both teams (well us since 1924.) It was a close game throughout and one team was going to go through and the other was to face teeth shattering heartbreak. For St Kilda, falling short in this game would be a disaster- to finish on top having won 20 of the 22 home and away games then to win the first final to take their season’s tally to 21 wins from 23 games would ruin the whole year. For us, it would be another lost Preliminary Final- 6 consecutive defeats in Preliminary Finals- St Kilda’s last three Preliminary Finals had ended in defeat, we had lost our last six. One team’s run of outs was to stop the other mob’s Grand Final dodging would continue on. It would be a close match and a gut wrenching loss again- and it so happened to strike us yet again- another defeat snatched from the jaws of victory in a final. There was a great atmosphere that night- loud roars when both teams kicked goals from a game where there was not many kicked that evening. Brad Johnson’s mark and play on goal in the last quarter gave the impression to ‘naturally made’ Footscray pessimists that maybe this would be our night but Riewoldt kicked the last two for St Kilda and they marched in, despite Western having give our very best. The ‘insert name team here’ clap, clap, clap is definitely monotonous and ho hum these days after 40 odd years of it, however it seemed that the St Kilda clap, clap, clap, was a lot louder and had more willing participants than the Bulldogs clap, clap, clap. Why is it not Western clap, clap, clap by the way, instead of Bulldogs clap, clap, clap? Does anyone ever hear – Saints clap, clap, clap, Cats, clap, clap, clap or Blues, clap, clap, clap? Ok you can’t split those three words in half, but why not Mag…Pies clap, clap, clap, Ti…Gers clap, clap, clap or Bomb…errs clap, clap, clap? St Kilda won the Preliminary Final but was arguably an unlucky ricochet away from winning or even gaining a draw in the Grand Final. So since Footscray’s 1924 VFA Premiership, the dogs have won just one Grand Final and the saints also just the one. St Kilda didn’t win any before 1924 either, being an unlucky Runner Up to Fitzroy in 1913. Footscray won the VFA Premiership in 1913, but to do a proper comparison between the two clubs it has to be done from 1925 onwards when they were together in the same competition. Who was been the more successful – or rather who has been the least unsuccessful? If St Kilda had of won the 2009 Grand Final they would be considered by most as being more successful than us because they would have had two flags compared to our one. Anyone wanting to present a case that the bulldogs had historically more success than the saints would then have to invoke the VFA History of Footscray and push our 9 Premierships to be added to the 1954 Footscray triumph as hard and often as possible. However as this chapter about Footscray and St Kilda is a comparison the 1898-1924 seasons cannot be used in the argument. The comparison has to begin from 1925. Here is a table that lists both clubs achievements from 1925 to 2009. The above table lists some of the high and low points of both teams. The ‘Involved at the Preliminary Final stage’ and ‘Already in GF’ (meaning already through to the Grand Final) refers to whether the clubs were playing in the Preliminary Final or in the years before 1994, when one team from each year would automatically progress through to the Grand Final without playing in a Preliminary Final. This was by winning the Second Semi Final. Footscray did this in 1954; St Kilda also won their Second Semi Final in 1965. These two occasions were the only time this happened for both clubs. So who has been the better performed club, or put another way the easier to follow? Hard question as there has been such disappointment for both and is there anything to be gained by one team lauding it over the other? St Kilda’s accumulation of 15 wooden spoons and their fans still coming back for more is a real test of loyalty, as is supporting a team that hasn’t played in a Grand Final for over 48 years. Then in 1979, St Kilda played one away game in which they finished the match with the sum total of 3 ‘sausage rolls’ for the game. That is an average of less than one a quarter. I saw some of it that evening on the replay and thought how could you go through a game and only kick three goals, trying to imagine the St Kilda fans standing there in the outer enduring that. I need not have worried about how they coped with their low score that day for too long because, later in that same 1979 season I saw the bulldogs in the flesh play the same opponents as St Kilda on the same away ground and like the saints, we finished that away match with 3 goals. If I am to try and get something from that match it is this. When I see a ‘celebrity bulldogs fan’ discussing their passion for ‘the doggies’ and I privately question the ‘lifelong’ proud and ‘famous doggies fan /dogs fans, or bulldog fans (they are never plain Western only fans let alone Footscray fans.) Anyhow I wonder if the likes of Julia Gillard, Muriah Muralitharan, Jason Gillespie and other politicians, sporting stars and entertainers were out there at Abbotsford in July 1979 when we were beaten by 122 points and kicked 3 goals for the match. I take it old time St Kilda fans think the same way about their ‘celebrity fans’ and whether they were there cheering on the saints at Abbotsford in 1979. Yet St Kilda have played in five Grand Finals since we played in our last, they have also played in 4 Night (or alternative) Grand Finals since we played in our last. St Kilda won three of those four NIGHT Grand Finals, so a 50 year old St Kilda fan has seen more joy than a 50 year old Footscray fan. So I would say that St Kilda have been the better club of the two to support –they have probably had worse low moments like 4 consecutive last finishes from 1983 to 1986, than some of our disasters, but their higher points have been greater and more satisfying than ours. We still await a Grand Final appearance- even the low brow night Grand Final with the funny rules. One day this non-achievement is all going to end and clocks on home pages can be changed or removed.